Major achievement, I’ve finally managed to read all the Niall Ferguson books I had on the shelf – well Colossus and The War of The Worlds, I’d bought them as soon as they came out in paperback, must be 7-8 years ago. I thought The War of The Worlds might come in useful as I’d been studying empires and decolonisation and am currently planning my last essay for the course. While not particularly useful for what I’ve decided to write about (using ‘decided’ in a very loose sense here), I rather enjoyed it and would pause every now and then and think to myself that Ferguson, whatever you think of him and his ideas, does make sense. He really hammers home the genocidal tendencies of the twentieth century, everyone seems to have been involved. Difficult as this may be to comprehend, there is a good quote from Sigmund Freud at the end of the book about man’s destructive tendencies that helps. I guess the reason I’ve enjoyed a number of Ferguson’s books now is that he underpins his arguments with a diverse range of writings – Freud, for example or a number of early twentieth century novelists and their experiences of WWI. I immediately wanted to go and read All Quiet on The Western Front again. Haven’t read it since school. I have a feeling that my grandmother’s copy is still about, that I had enough sense to ask mum to post it to me in the ‘best of childhood/ growing up’ edit box before their move. Might look for it over summer although, being quite old, it would need a good airing prior to reading. I’d also found Victor Klemperer’s story particularly moving because I’d recently read Slaughterhouse 5, which deals with the bombing of Dresden, the effects and aftershocks felt by the US POWs present. I think this is why Ferguson is such a successful writer, he gives you the hard facts and analysis but he is also very readable, regardless of whether you find his arguments convincing. He includes characters outside the political power plays and this adds not only a level of humanity but also brings closer the events he writes about. This is a good thing for me as my next course (starting in the autumn) is all about the twentieth century. Now I just need to get this last empires essay out of the way and then I can seriously get on with clearing the ‘pile of shame’ of books, which has only grown and grown over the past few months. Current size: utterly ridiculous and totally shameful! Every new Culture novel by Iain M. Banks is welcomed by a whoop and I like to read them as soon as possible. Hugely enjoyable, so fabulously imagined, just a great little bit of escapism – although they tend to be quite heavy (physically) so perhaps ‘little’ not the best word to describe them. Having purchased The Hydrogen Sonata a couple of months ago, I’ve finally read it. This is the best bit of Christmas holidays – the amount of time I have for making friends with sofa, blanket and books. The book, by the way, was very enjoyable and well imagined, funny too in places, just not quite as fabulous as some of the others. I do love it when Culture novels heavily feature ship Minds, which The Hydrogen Sonata did, just thought perhaps the story was a tiny bit weak. Not a disappointment by any means, just not one of the best. Have also realised that I’ve never read Use of Weapons, which seems to be a favourite with many Banks Culture lovers so have got that too. Won’t be reading it straight away though as ‘pile of shame’ of unread books has grown quite a bit with some lovely Christmas presents. The other book I’ve also just finished but not posting separately is Niall Ferguson’s Colossus about America and (un)imperialism. Had it for ages (‘pile of shame’) and it bore some relevance to the course I’m doing at the moment so I thought I might as well read it. It was pretty good too. 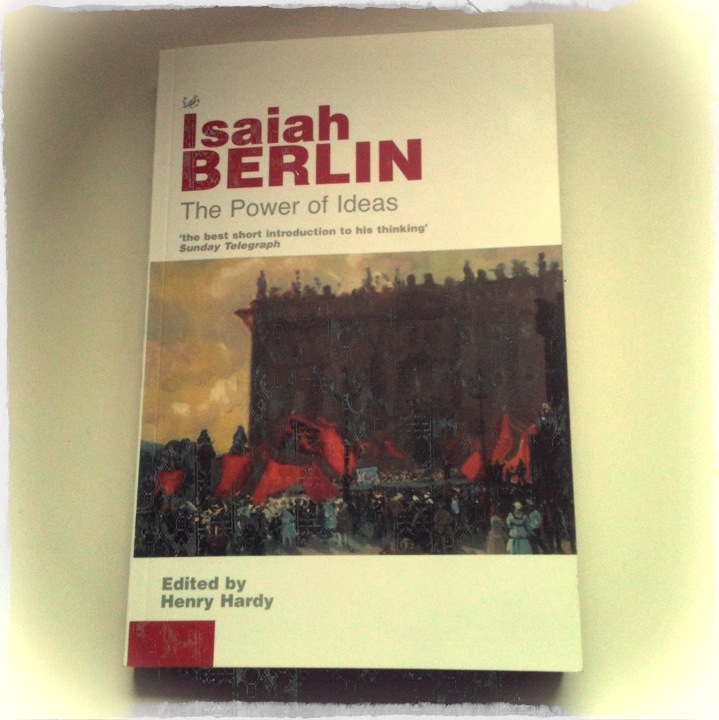 This isn’t really my usual reading material but was on a recommended reading list for a course I was quite interested in last year on cultural history/ history of ideas. Bought it last summer alongside a Michel Foucault book that I never finished (a bit pretentious I thought) and it’s been in the loo library since. It was a pretty easy and quick read, a collection of essays that I rather enjoyed. More so as quite a few were dealing with Enlightenment, Romanticism, Marx, writing of history and so on, things I have some knowledge of and reference points that I could understand. Even though the majority of essays were written about 60 or so years ago and thinking has changed since, found it pretty useful for an amateur like me.